For Greg Merhar, deciding to have his whole genome sequenced ended up diagnosing the cause of pain he'd lived with his whole life. His wife, Dr. Debra Leonard, recently spearheaded a pilot study at UVM to sequence the genomes of 73 university staff. Thirteen years ago, it cost nearly $3 billion to sequence the first human genome. Now that cost has plummeted to closer to $1,000 per genome, making it likely an increasingly common tool for patients in the not-so-distant future – and the subject of a recent pilot study at the University of Vermont. Dr. Debra Leonard, the head of pathology at UVM, wanted to study just how learning information about one’s genes affects people’s health and well being. She also has a personal connection to just how drastically genetic information can change a person’s life: by having his whole genome sequenced, her husband was able to identify the disease that had been causing him severe pain for 40 years. Leonard spearheaded a pilot study —a joint project of UVM College of Medicine and the UVM Medical Center— where 73 university physicians and leaders volunteered to have their entire genome sequenced. “This program is somewhat unique in that we wanted to do genomes of, however many people, in a way that was medically appropriate,” says Leonard. “We wanted to make sure that they had genetic counseling before they gave informed consent and knew what they were agreeing to have done." Leonard is a molecular pathologist who has been doing genetic testing for 24 years. She’s currently working to bring multiple kinds of testing to UVM. “My vision in coming here three years ago as chair of pathology and laboratory medicine was to implement broader genome sequencing for clinical care here in Vermont,” says Leonard. She has developed a program to run genetic tests on people’s tumors to diagnose the cancer and predict the patient’s prognosis. Another test will screen patients to see if they are at risk for certain inherited cancers. And still another project in the works will test certain patients to predict response to different treatments — this helps doctors make sure the drugs they are prescribing will work for that individual. But her most recent pilot project goes even further. Leonard set up an Understand Your Genome workshop where 73 UVM staff volunteered to have their whole genome sequenced. The test analyzes every single gene — there are more than 30,000 in the human genome — to see if the participant has any inherited risks or diseases that can be addressed. The Understand Your Genome project is run by the genetic analysis company Illumina. But Leonard wants to do more than just provide people with the amazing data set of information about their genes. She set up a pre- and post-interviews with a genetic counselor to make sure the participants were properly coached on what kind of information they could be receiving — good, bad and confusing. Leonard has worked in the field for over two decades, but she also has personal experience regarding how whole-genome testing can bring surprises. She and her husband, Greg Merhar, gave each other a unique gift for Christmas in 2014: They each had their whole genomes sequenced. The Illumina report for Merhar highlighted three gene variants of “unknown significance, but suspicious.” One of those was a mutation in the gene known to cause Familial Mediterranean Fever (FMF). Merhar says it’s highly unlikely that any doctor would have ever thought of checking him for this disease. “I have blond hair and blue eyes, and FMF is typically [associated with] Arab, Turk, Armenian, Sephardic and Ashkenazi Jewish,” he says. For nearly 40 years, Merhar has lived with bouts of ongoing joint pain and crippling abdominal pain. “I’ve had MRIs, and X-rays, and cortisone shots — and all kinds of stuff, in basically my Achilles,” says Merhard. So he started reading more about the FMF gene and discovered it has to do with how the body regulates inflammation. He realized this could be why his joints flared up and the pain never resolved. It took some serious convincing, but he was finally able to convince a rheumatologist to give him a trial prescription for the drug used to treat FMF. “And honest to goodness, I took it on a Friday night, by Saturday morning I was feeling probably better than I had in years,” says Merhar. “And after three or four days I realized how much pain I have been in for all these years. Everything just kind of went away. 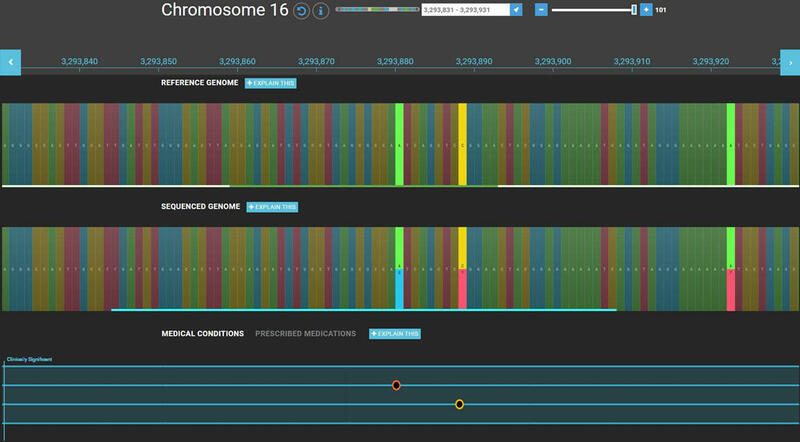 This is a snapshot of Merhar's genome showing the FMF gene variant that causes his disease. The numbers at the top show the mutation occurs at his 3-millionth nucleotide base pair. That's a lot of data to analyze! It cost Merhar $5,000 to sequence his genome, and he says it’s the best money he’s ever spent. Since last year, the cost of sequencing has come down to closer to $1,000. That’s a far cry from the nearly $3 billion it costs an international team of scientists to sequence the first human genome 13 years ago. For decades the medical community has known that certain genes are associated with specific diseases and has been able to test patients for those variants. But “situations like this where we’re actually sequencing ostensibly healthy people," says Dr. Robert Green, a medical geneticist at Harvard University, "is relatively new." “Because what we’re asking is, could we be finding things in them that would be medically useful for them as their life progresses? Would we be able to find risk factors for diseases that we can do something about?" Green says. Green recently spoke to the UVM staff volunteers who had their genome sequenced as part of the Understand Your Genome project. “I think the jury is still out on whether genome sequencing is an appropriate screening methodology or not, for the general public," he says. Can what we don’t know hurt us? Of the 73 UVM staff who were screened recently, six people received news that they have a gene variant which could indicate a significant disease risk. There are now thousands of different testable genetic disorders. But even still, there are plenty of gene variants where the not all questions can be answered. For example, Leonard says that after scientists identified the gene that causes cystic fibrosis, they realized that there are many, many variants in that gene. “People with those variants don’t always have full-blown lung and pancreatic cystic fibrosis," she says. "They might have chronic bronchitis, they might have chronic sinusitis, they might be infertile." And in other cases, having one’s whole genome sequenced could reveal scary information that science simply doesn’t know enough about to treat, says Green. But scientists are learning new information about genes every day. So far, millions of human beings around the world have had their genome sequenced as part of research studies, but those people don’t get their information back. Only a few thousand people in world — including those 73 at UVM — have had their genome sequenced and received clinical reports. But that is changing fast. The Vermont Health Department is seeking a federal grant to help educate the public about the risks associated with the Zika virus. Health officials stress that it's very unlikely that mosquitos in Vermont will transmit the virus. Vermont has made it easier for both women and men to get birth control services. For the first time, new legislation requires that vasectomies are added to insurance policies — with no co-pay for the patient. Gov. Peter Shumlin's ambitious plan to have Vermont become the first single-payer health care state in the U.S. never materialized, but in a quieter way, the health care system in Vermont is changing. An astrophysicist at McGill University in Montreal has achieved some significant milestones. At age 48, Victoria Kaspi is now tied for the youngest person to win the Gerhard Herzberg Award – Canada’s top prize from the Natural Sciences and Engineering Research Council of Canada. And she’s the first woman to do so.